Welcome to our Aspen Showhome here at 7 Fireside Terrace. We’re looking forward to walking through our latest showhome with you on this guided tour of all the stand out features that we’re proud to offer you and your family. When you first enter this home through the large pantry, you’ll notice that it features motion sensor lighting, making it easy to bring in groceries with your hands full or grab a midnight snack with just enough light. If you continue to look around the space, you’ll notice the beautiful lacquered lockers and shelving for plenty of storage space that still looks polished when empty. As well this pantry features 12 x 24 tile flooring which is larger than most other showhomes. Details are important to us, even in your pantry! 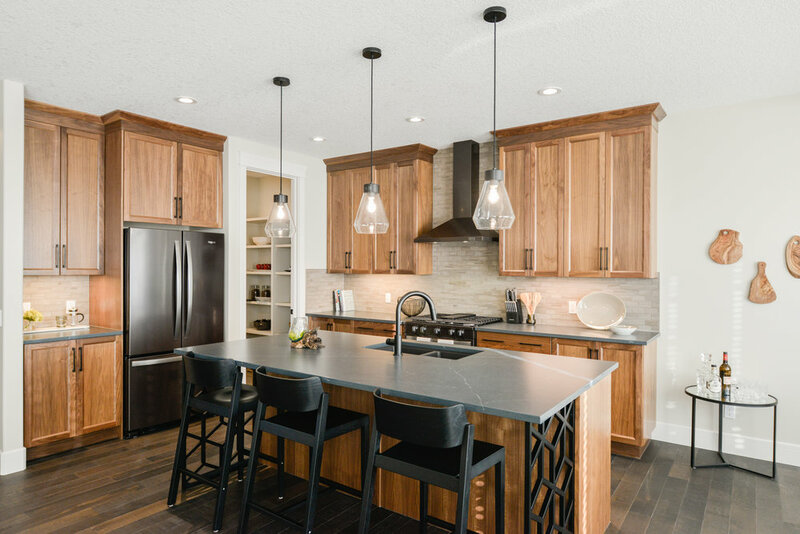 As you move through the pantry into the large open kitchen space, we hope you’ll notice the full height black walnut cabinets with crown mouldings. This additional feature brings beauty and polish to the kitchen space. All the drawers and cabinets are soft close, meaning they won’t slam shut or cause damage when accidentally bumped. Meanwhile, full extension drawer glides throughout the kitchen space make it easy to access pots and pans in larger drawer areas. We’ve purposefully built in under cabinet lighting to help showcase the charcoal soapstone quartz countertops and Whirlpool black stainless steel appliances. The large Blanco sink is under mounted to make it easy to prepare meals and clean dishes with minimal effort. In this kitchen, the gas range has two banks of drawers on either side and features a decorative black stainless steel hood fan. The island in this kitchen is oversized and features custom matte black island supports and offers extra prep space for family meals and additional seating for holiday gatherings. We took care to add USB charging stations make this kitchen fully functional for the whole family, plus it’s nice not to have to fight over chargers. Moving around the rest of the main floor, take a second to notice the wirebrushed oak wide plank hardwood flooring. We’ve included flushmount hardwood vents to prevent tripping and catching on vents, as well as 9’ main floor ceilings. If you peak your head just off the kitchen and dining area, you’ll see a 12’x14’ rear deck with gas line for BBQ or patio heater and a 10’x20’ rear parking pad with laneway access. Meaning you can entertain and have extra parking storage for your summer toys. The main floor family room features a contemporary gas fireplace and custom lacquered mantle with geometric mosaic and marble Athens grey perimeter. Here at Janssen homes, we believe in craftsmanship and unique but thoughtful details. The main floor also features lacquered railings with metal spindles, upgraded black plumbing fixtures, and Matte black Milan door hardware, as well as an upgraded light package with LED bulbs. This home also features 8’ doors, and 3” casing and 6” baseboards. Now that you’ve seen the main floor family room and kitchen let’s check out the powder room. In the main floor washroom, we’ve provided a water saver toilet with soft close lid, taking care to paint the vanity and install charcoal soapstone quartz countertops. As you walk past the power room, the main floor entry offers a custom cut bench with hidden drawers for storage to help keep your main entry clean and tidy for when company might arrive. If you head up to the second floor, you’ll see at the top of the stairs a large bonus room space with Knockdown ceiling texture, softline drywall corners as well as a vaulted ceiling. There is also a soundproofing wall between the bedroom and bonus room to ensure movie nights never affect guests or those headed to bed early. Moving to your right, you’ll see the upstairs laundry room. This laundry room has custom wooden shelving, built on site to ensure a perfect fit. We’ve also included painted cabinets, a stainless steel sink and pull out the tap, and charcoal soapstone quartz countertops by SILESTONE. The laundry room is completed with Whirlpool chrome shadow front load washer and dryer. Doing laundry might not always be pleasant, but it can be done in a functional space. As you move further along the hall, you will enter the Master bedroom. This Master Bedroom features a gorgeous ensuite with charcoal soapstone quartz countertops & backsplash. We have added luxury Saltillo cement floor tiles in Sofia black, full tiled shower and 10 mil glass. As well, this floor is electrically heated tile with a programmable thermostat for those chilly Cochrane mornings. The beautifully finished shower features a hot water recirculation line in the floor for instant hot water, which keeps the shower floor warm as well. The shower is also equipped with a rain head and hand shower with a slide bar for optimum cleansing and relaxation. This Ensuite features a painted vanity with six soft close drawers and contemporary dual undermount sinks, we’ve also added Trinsic black bath fixtures. Let’s not forget the incredible oval free-standing tub with wainscoting. The main area of the Master bedroom also features a walk-in closet with site built lacquered custom shelving, memory shield 8lb underlay for carpet with spill protection in case you like to drink coffee while getting ready for the day ahead. The basement features 9’ ceilings and wall framing members 16” on centre throughout the home. There is also a roughed in bathroom for future development, a high-efficiency furnace, 60-gallon gas hot water tank and an air conditioner. This home also offers an Ecobee4 smart thermostat with built-in Amazon Alexa voice service, drip humidifier, active heat recover ventilator. As well as R-50 attic loose fill insulation, R-20 exterior wall insulation, R-20 spray foam to main and upper floor rim joists, and 2 exterior hose bibs. We’d love to answer any questions about this guided tour or features in this home. We’d also like to thank you for visiting us and taking this tour. Please let us know if you have any questions or comments.